Of course, given a choice, one would prefer to only mix with others of one's own class, but circumstances sometimes compel us to do things we never thought we would. That is the attitude of Mrs. Wray, a widow living with her 20-something daughter Frances in post-WWI London in The Paying Guests. Her two sons were killed in the war and her husband died soon afterwards. Far from being well-off, Frances and her mother are stunned to discover that her father has left them pretty much destitute. The only real asset they have is the large house they live in. After scrimping and getting by as frugally as possible, they finally come to the conclusion that they'll have to take in lodgers to make ends meet. Enter Lillian and Leonard Barber. They are a cheerful young couple who take the upstairs rooms in the Wray household (except that Frances also has her bedroom upstairs, so there is inevitable interaction between her and the Barbers). Of course, the Barbers are the "clerk class" and Mrs. Wray, while cordial, continues to feel herself superior. Leonard works for an insurance firm and is out working most days, while Lillian is left behind to keep house and "decorate" (she has a love of everything frilly and frivolous). Mrs. Wray occasionally ventures out for "charity work" or to visit neighbors, and poor Frances spends her days doing all the drudge work at home (a fact her mother is terribly embarrassed the neighbors might discover, but not to the extent that might induce her to help her daughter out). Frances, it turns out, is a bit of a radical. Her one friend, Christina, is involved in political issues and at one point the two women were involved in an "inappropriate" (according to Frances's parents) relationship. Christina wanted Frances to leave her parents so they could move in together, but Frances was unable to make the break. Christina now lives with another woman, but Frances visits her from time to time. Eventually, being left alone together for long periods of time, Frances and Lillian also become involved in a relationship. They enjoy the secretiveness of it, sneaking around when Leonard and Mrs. Wray are out. They even begin to discuss how they could run away and have a life together. The two women are seriously considering this course of action (even though it would cause a tremendous scandal) when Lillian discovers she's pregnant. This sets in motion a chain of events that will have a terrible impact on everyone's lives. A crime is committed, and the two women must work together to cover it up, while at the same time trying not to turn on each other in their panic and despair. I really enjoyed the book, even though it seemed to me nothing really happened until at least half way through. It's definitely the definition of a slow burn! However, once the events get set into motion, it really is a page-turner as you try to figure out what will happen and if the two women will manage to come out of it with their freedom (and lives) intact. I was mostly annoyed with the feeble Mrs. Wray, who didn't seem to have any medical issues, but nonetheless was apparently helpless -- depending on her daughter to do all the cooking, cleaning, shopping, bill-paying, etc. while she sat around being all haughty and judgmental. I guess this really emphasized the societal changes that happened in England after WWI, when class barriers were blurring, and formerly upper-class people came to the realization that they no longer had servants to do all their chores (well, the younger generation seemed to realize this, I don't think Mrs. Wray ever did). All in all, this is an interesting story about the forbidden relationship between two women at a time of a great shift in societal attitudes. The suspenseful aspect that takes over the second part of the book really made this a gripping novel. 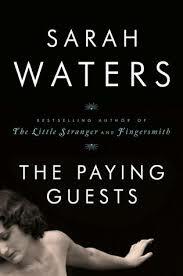 I hope it will be made into a film soon, as most of Sarah Waters's other books have been.